MRI, as an imaging modality, offers tremendous soft-tissue contrast without any use of contrast agents. Even beyond anatomic scans with T1, T2 or proton density weighting, other methods like arterial spin labeling or diffusion imaging exist which leverage both physics and physiology to tease out new information in a scan, making MRI the single most versatile non-invasive imaging method in the medical arsenal. However, the use of paramagnetic contrast agents (usually administered via IV) is still an integral part of a routine MR exam, for good reason: contrast in MR simply gives us another lever with which we can manipulate the system, providing much more anatomic and functional information. To that end, the Nephrogenic Systemic Fibrosis (NSF) advisory from the FDA is of grave concern. For the vast majority of patients, gadolinium-based contrast agents are perfectly safe, but there still is a need to look for improvement. …iron-containing magnets just two nanometers wide, dissolved in water, do provide reasonable contrast in non-clinical MRI images—as long as the nanomagnet concentration is below a certain threshold. (A nanometer is one billionth of a meter.) Previous studies by other research groups had reached conflicting conclusions on the utility of molecular nanomagnets for MRI, but without accounting for concentration. NIST scientists, making novel magnetic measurements, were able to monitor the molecules’ decomposition and magnetic properties as the composition was varied. 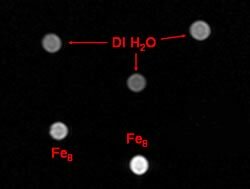 This test image shows what happens when nanomagnets are used to alter the nuclear properties of hydrogen in water, increasing brightness (bright spots below left and center) compared to deionized water (above). These magnets are a single molecule, less than 5 nm in size. The potential for increased contrast effectiveness, as well as being able to label other biocompounds with them for true molecular imaging, is enormous. We report the nanoscale loading and confinement of aquated Gd3+n-ion clusters within ultra-short single-walled carbon nanotubes (US-tubes); these Gd3+n@US-tube species are linear superparamagnetic molecular magnets with Magnetic Resonance Imaging (MRI) efficacies 40 to 90 times larger than any Gd3+-based contrast agent (CA) in current clinical use. There have been a spate of other published works in the literature in this direction as well, of course. It’s clear that there is a lot of ground to be gained yet in terms of optimizing these new agents and bringing them to market. But assuming that they do get there, the nanoscale revolution will certainly leave its mark on MRI as a field. I wouldn’t be surprised to see nanotech contrast agents in the market within 5 years, or even less. A technique integrating multishot periodically rotated overlapping parallel lines with enhanced reconstruction (PROPELLER) and parallel imaging is presented for diffusion echo-planar imaging (EPI) at high spatial resolution. The method combines the advantages of parallel imaging to achieve accelerated sampling along the phase-encoding direction, and PROPELLER acquisition to further decrease the echo train length (ETL) in EPI. With an eight-element circularly symmetric RF coil, a parallel acceleration factor of 4 was applied such that, when combined with PROPELLER acquisition, a reduction of geometric distortions by a factor substantially greater than 4 was achieved. The resulting phantom and human brain images acquired with a 256 x 256 matrix and an ETL of only 16 were visually identical in shape to those acquired using the fast spin-echo (FSE) technique, even without field-map corrections. It is concluded that parallel PROPELLER-EPI is an effective technique that can substantially reduce susceptibility-induced geometric distortions at high field strength. To examine what makes a good reviewer, they took advantage of the journal Annals of Emergency Medicine, which has maintained a detailed database of reviewers and post-review ratings (on a five-point scale) of their work, performed by the editors of the journal. The researchers contacted the reviewers and surveyed them about various factors that might contribute to skill in the process. A diverse set of 306 reviewers who had performed a total of nearly 3,000 reviews were used as the data set. In news that may be disturbing for journal editors everywhere, very few factors leapt out as having a consistent and significant correlation with the quality of a review, although some factors did have strong correlations in individual tests. The only positive factors linked to quality of reviews were age (younger reviewers were better) and working at an academic hospital. Ironically, service on an Institutional Review Board, which evaluates and approves experiments on humans, consistently correlated with lower-quality peer reviews. Even these factors, however, were only slightly better than random at predicting review quality. Ultimately the peer review process is always going to have a subjective component to it, since the processes of intuition and patterning that are fundamental to scientific insight and understanding are not really very deterministic. But there’s another possible reason why the study failed to find strong correlates of review quality; the very assessment of quality itself is equally subjective. I personally believe that the peer review system is like democracy – far from ideal but better than anything else out there. The best way to ensure general quality is to ensure that a maximum number of scientists in a given field participate in the process. Perhaps one way to achieve this would be to extend reviewer privileges to graduate students who have passed oral qualifiers? Here’s a great resource for sharing powerpoint slides online: SlideShare. Many of us have useful presentations that we’ve created for various academic or professional purposes; if you upload a presentation to that service please tag it “@refscan” so we can create an automatic table of contents for presentations here. I’ll update this post and upload a simple one later this weekend here as a demo. The FDA has an updated Public Health Advisory on the safety of gadolinium-based MRI contrast agents. In a nutshell, patients with any sort of renal disease or otherwise compromised kidney function are at high risk of developing Nephrogenic Systemic Fibrosis (NSF) or Nephrogenic Fibrosing Dermopathy (NFD) if they receive gadolinium contrast agents for MRI imaging. There seems to be no risk for patients without compromised kidney function. 1. Published, peer-reviewed research and their own research. 2. Their expert opinion on actual scientific debates – think review articles. We at Reference Scan will be participating in the Just Science Challenge. In fact if you registered as a user here at RefScan you might find that I’ve already upgraded your account to be able to post to the front page, because I can use the help! There’s already an extensive list of participating science blogs. Magnetic Resonance Imaging is a field that is uniquely abused by anti-science and one that I think needs to be represented in the online scientific community. So let’s plant our flag and meet the challenge. Should be fun! Technically, magnetos are the exact opposite of an electromagnet, but the Marvel Comics character remains our field’s patron saint by virtue of artistic license.